Buhari to governors: How do you sleep soundly without paying workers? President Muhammadu Buhari Tuesday in Abuja expressed concern on the growing complaints and agitations by workers in states over unpaid salaries and allowances, in spite of interventions by the Federal Government. 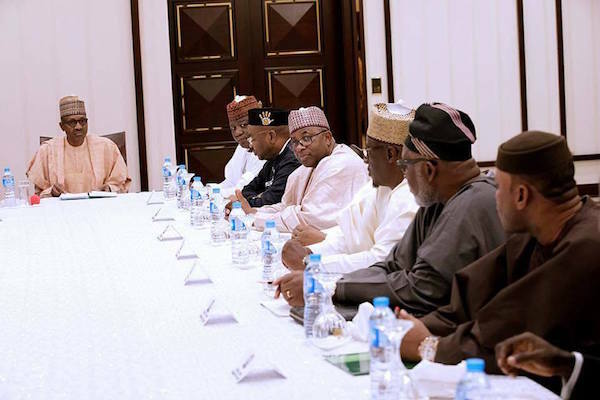 Receiving a group of governors led by the Chairman of the Nigerian Governors’ Forum, Abdul’Aziz Abubakar Yari, at the State House, President Buhari said the plight of workers in the states need urgent attention as many could barely survive. In his remark, the Chairman of the Nigeria Governors Forum said the various interventions by the Federal Government, which include the bailouts, were judiciously utilized by the states, stressing that the governors inherited backlog of unpaid salaries and huge debts portfolios on assumption of office.